I’ve re-watched this movie after so many years. Despite the fact that this film is already 22 years old (how time flies), it can easily compete with contemporary films in the thriller genre. Robert De Niro plays a brilliant role as the revenge-hungry maniac Max Cady, who returned out of prison as a literate and fairly smart man. Somehow he found out that his lawyer Sam Bowden (Nick Nolte) held back a report during the trial. A report that could have reduced his sentence. De Niro is very convincing as an intriguing, psychopathic madman. The way he looked at the young daughter when she appeared in the garden the first time, spoke volumes. The entertaining conversation with a friend of Sam Bowden seems like chit-chatting but at the same time, it has a threatening undertone, which is confirmed afterward. Nick Nolte plays Max’s ex-attorney, Sam Bowden, who you’ll see evolving from a successful lawyer with his marriage falling apart because of his affairs and an emotionally disturbed teenage daughter, into a tense nervous little puny guy who isn’t afraid to use not so kosher means to get rid of annoying crook and kick him out of his life before it’s ruined completely. The threatening mood of this movie lies in the fact that it’s possible that some scum of the street (like an ex-con) can return as a crafty, intellectual person, who’s smart and clever enough to make someone’s life miserable, without doing anything wrong in a direct way. The tipping point is the scene in a theater at school between Max and Danielle, the daughter. This scene is so loaded with eroticism and you can feel the acceptance of Danielle. From here the film goes at a rapid pace and the threat increases. Sam fakes a departure by plane to trick Max. The rebellious daughter slowly begins to turn against Max and eventually, it all unravels on the family houseboat. 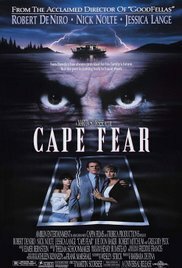 “Cape Fear” is a superb film. A classic with a capital C.